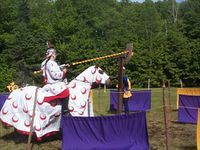 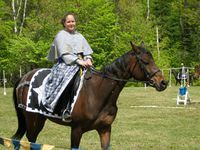 Just as a person needs an attempt at pre-17th century clothing to participate in SCA events (see Dressing the SCA Rider), a horse should be appropriately dressed as well. 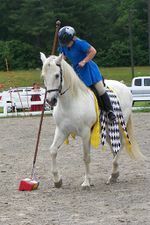 There are many options for dressing horses, ranging from a simple cloth cover for a modern saddle pad, though elaborate caparisons that cover most of the horse's body. 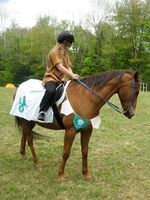 Simple saddle pad covers are an excellent place to start. 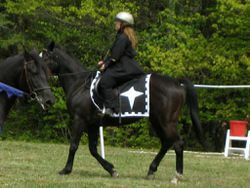 Since the cover does not extend much beyond an ordinary saddle pad most horses don't even realize they're wearing one and there are no heat dissipation issues to be concerned with. 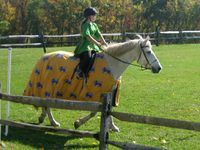 They can be as simple as a plain rectangular of fabric measuring slightly larger than your saddle pad or you can decorate them with complex heraldry or other designs. 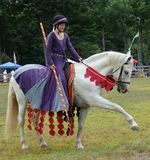 Remnant lengths of fancy brocade can also work well, just keep in mind that anything that goes near a horse should probably be washable. 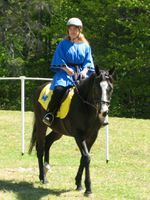 Instructions for making simple Dagged Saddle Cloths. 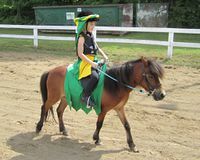 These require at least a short introduction to the horse because the dangly bits can blow about in the wind. 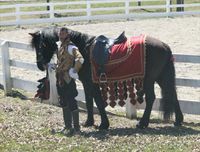 Some horses require a bit of practice with having fabric flapping at their sides or under their belly but most adapt very quickly. 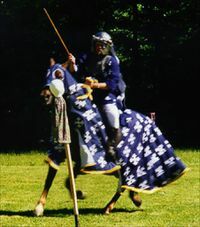 Full caparisons include a hood, either separate or integrated with the shoulder, covering the horse's neck and face. 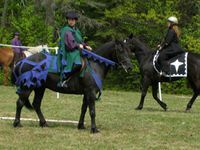 This page was last edited on 29 March 2015, at 20:50.